As a basketball analyst it is always interesting to assess how assists factor into the game. At the NBA level the assist is an underrated statistic. Perhaps because it is difficult to properly calculate an assist’s impact. They can tell you so much yet don’t give you enough information when you look at the stat in isolation. While some people count an assist one way others can come to a different conclusion. It’s perhaps the only statistical column in the box score that relies on the opinion of the evaluator. On an official level “it’s a pass that directly leads to a basket” but that is such a broad phrasing that it can leaves a lot to interpret for the scorekeeper evaluating the game. For instance, if the ball makes contact with the floor rather than directly leading to the basket it is up to the scorekeeper whether to count an assist or not. Another example, say a cutter is hit by a passing player off two dribbles with a clear path to the basket, defender or not does it count as an assist? Some note it down as an assist while others don’t. The “leading to” or in other words the immediate factor can mean different things to scorekeepers allowing for variations interpretation to take place. Looking at the table below, what can be derived from it is that while the Magic scorekeepers are the least reluctant to count assists to their players the GSW on the other hand are the most generous by far in the league. 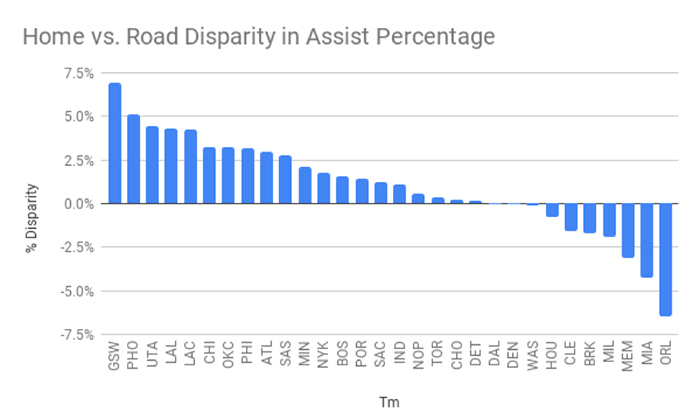 Another point to take into account is that taking into account the assist percentage versus the overall number of field goals, League-wide home teams usually get about 1.1 percent points more credited than the road team. It’s commonly acknowledge that not all shots are equal and this also applies to assists. When broken down into areas of beyond the arc, around the rim, and from the semicircles; shots are valued differently. Shots around the semi-circle are worth 0.8, beyond the arc 1.1 and around the rim 1.3. When assessing shot effectiveness, considerations such as True Shooting and effective FG% are always kept in high regard, yet when an assist efficiency is looked at there is no credit ever given to the efficiency of the passer. It is always credited on the scorers end due to completing the value. Passers that feed players closer to the rim usually see a higher effective FG% off their passing. 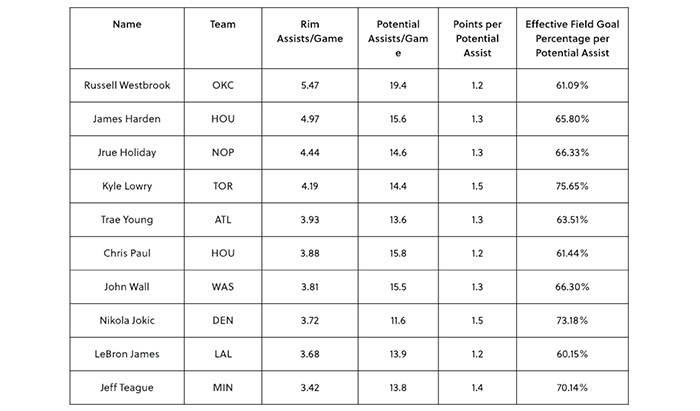 So much so that, those in the Top-10 in assists at the rim per game have 60% of eFG% listed (the table below has rim assists coming from pbpstats.com and the remaining assist based stats come from stats.nba.com). In some cases an isolation play leads to a teammate breaking down the opponents and eliminating his man, leading to him assisting an open player. In other cases, the team’s system on offence is set up to play through a screen, a curl or a cut that leads to an assisted point. So overall, while in some cases both passer and scorer might do equal work, in other cases a passer or scorer might not need to do any work at all to be credited with the assist. This is a fact that it can cause confusion when all factors are not accounted for properly. Does this take away from the overall value of assists and mean that they should not be considered as a benchmark stat? Not at all. However there is suggestion that it should not be an absolute measure of a player or team’s ability. It would be shortsighted to consider them so without the necessary context. In order to appreciate the whole notion of passing in the game at the NBA level, there has to be a deeper look into how you actually credit both the passer and scorer. Is the passer operating within the set play of an offence or is he creating a possession where his intention is to create an assisted basket? Do passers take care to dish the ball in low or high efficiency zones to the scorers (based on tendencies) while setting them up? 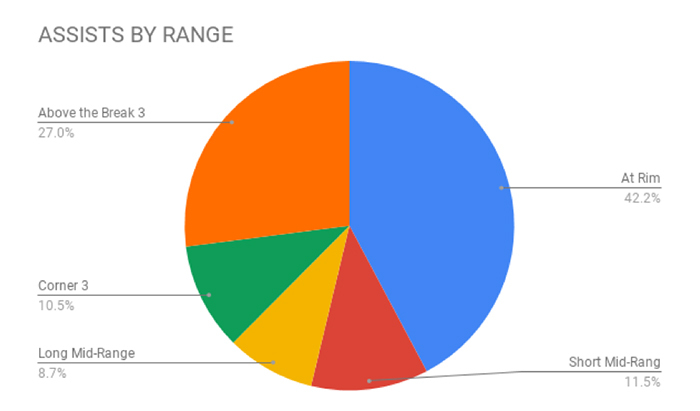 So keep an eye on how, why and where an assist occurs during the game and it’ll make just counting the number of assists that much more effective and allow you to draw much more informed decisions about your favorite team. Read more basketball betting articles and get the best NBA odds with Pinnacle.